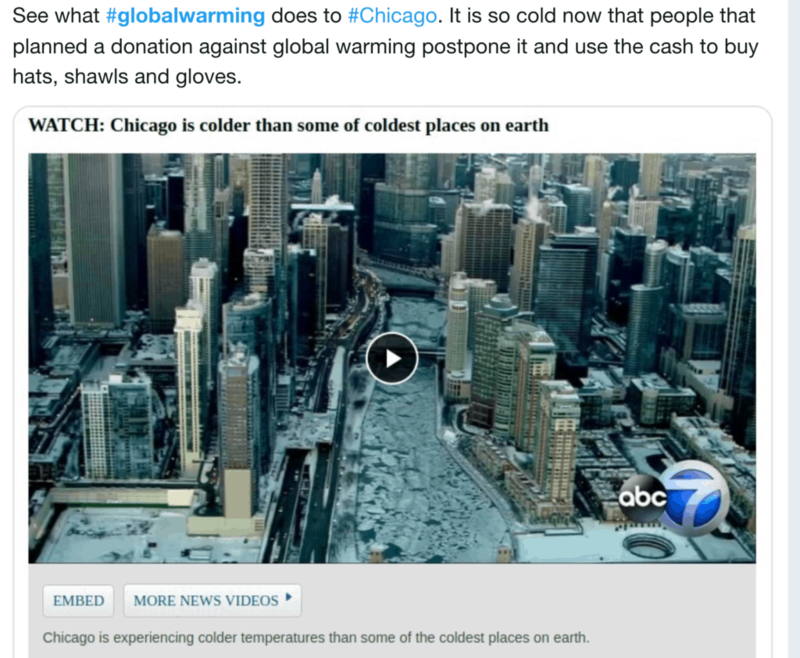 As of this writing, some parts of the U.S. are suffering wind chills of 77 below zero. Six states are reporting temperatures as low as those at the South Pole. In Chicago, train operators are using fire to keep the trains running. At such cold temperatures, the metal rails shrink, allowing them to pull apart at the connections. When that happens, gas-fed systems that run alongside the rails are used to heat the rails so that they expand and can reconnect. Even if you thoroughly understand the difference between weather and climate, you’ve got to admit…this situation is almost too tempting to resist. If only the scientific community had used the term “climate change” from the beginning. When NASA scientist James E. Hansen used the term “global warming” in his testimony before Congress in 1988, the term stuck, and I believe that’s the main reason we’ve been arguing about it ever since. What’s that got to do with marketing? It’s got everything to do with marketing, because it illustrates how difficult it is to change an association once you’ve successfully established it in your audience’s minds. You can blame it on ignorance, and in some cases, that may be true. 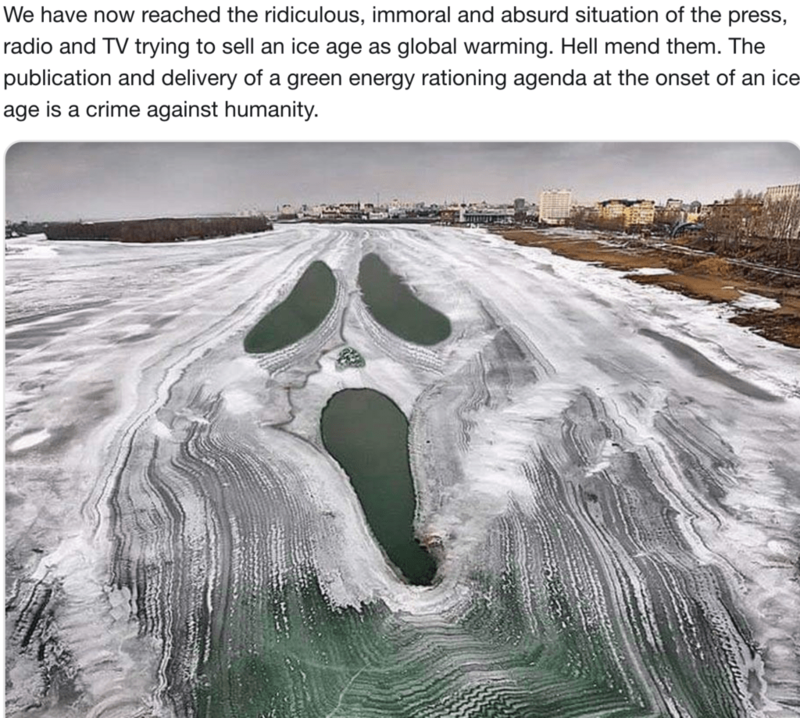 But I think there are plenty of folks who believe global warming is real who can’t resist opportunities like those presented by the current images of hell freezing over. And it could all have been prevented if scientists, from the very beginning, had communicated their findings from the perspective of a marketing campaign targeted to the general public. They greatly underestimated the role the general public must have in reversing climate change and, therefore, didn’t recognize the need to speak to them in a way that would energize them and get them on board. 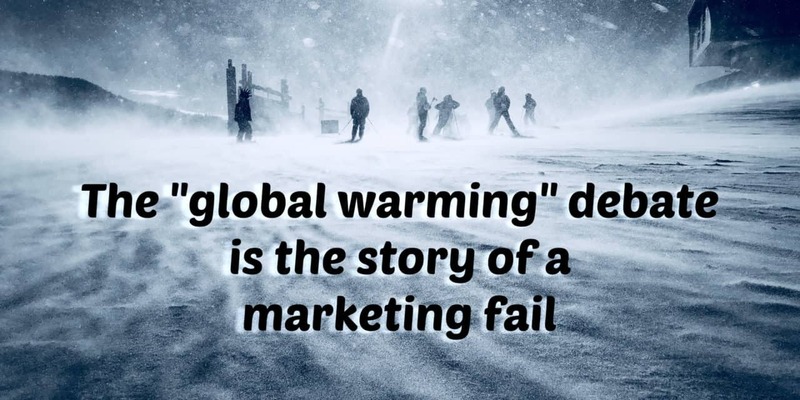 They suffered from the “curse of knowledge” and assumed that the general public would understand that “global warming” included not just higher temperatures, but other extreme weather patterns, like deep freezes and more severe storms. 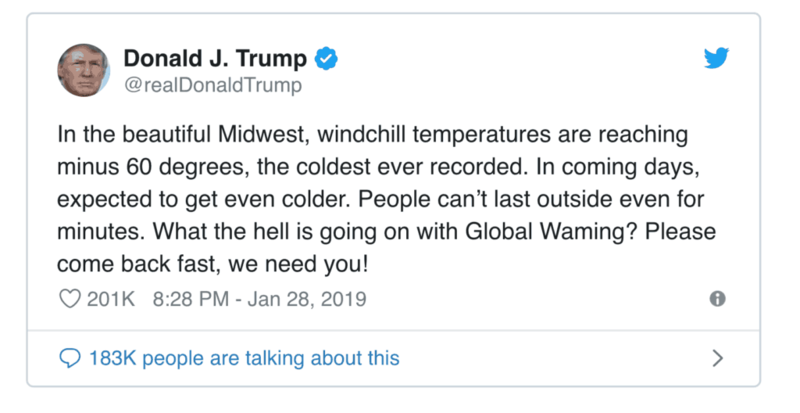 Either way, you wouldn’t have people insisting that global warming can’t be real when we’re experiencing record-breaking cold temperatures. Have you seen an Overstock commercial lately? They’re jumping through hoops to let people know they’re more than just a place you can go to buy surplus merchandise on the cheap. Overstock was launched in 1999 in an attempt to benefit both consumers and retailers/manufacturers by providing a marketplace where consumers could buy excess, liquidated products at bargain prices. The name fit then, but the company eventually changed their business plan so that, instead of selling only surplus merchandise, they were selling first-run products like furniture, home decor, and even cars. To their credit, they did realize that the name “Overstock” no longer fit and attempted to rebrand themselves as “O.co”. That rebranding attempt was a big flop, partly because people were used to typing “Overstock” and partly because those who did remember the name change typed “O.com” out of habit. There’s plenty of advice out there on how to choose a name for your product or company and, for companies with enough capital, there are consultants who will be happy to do it for you. But let’s start with some common-sense questions you can ask yourself. In other words, will customers know what your name means (and does that matter)? There are plenty of hugely successful companies out there whose names don’t provide the first clue as to what the company does: Apple, Disney, Nike, etc. But those companies have spent years building their brand capital. Assuming you’d rather have customers remember who you are and what you do now, it’s probably better to choose a descriptive name. Then there’s the case of Overstock.com. Their name did fit when the company was founded, but then they changed their business model. What if your company goes through the same type of transformation? So have some deep discussions on company strategy and where you see your organization 5, 10, 15 years down the road. Rebranding is as expensive as heck and doesn’t always work, so choose a name that will fit your company or product for the long term. What is your audience’s knowledge level (when it comes to your industry or product)? This is where the scientific community messed up on global warming. People who do, regulate, or fund what they do. People who buy what they do. In this case, the scientific community targeted the first group: the legislators who make policy and provide funding. And they nailed it. But they didn’t think about the third group: people who buy what they do. 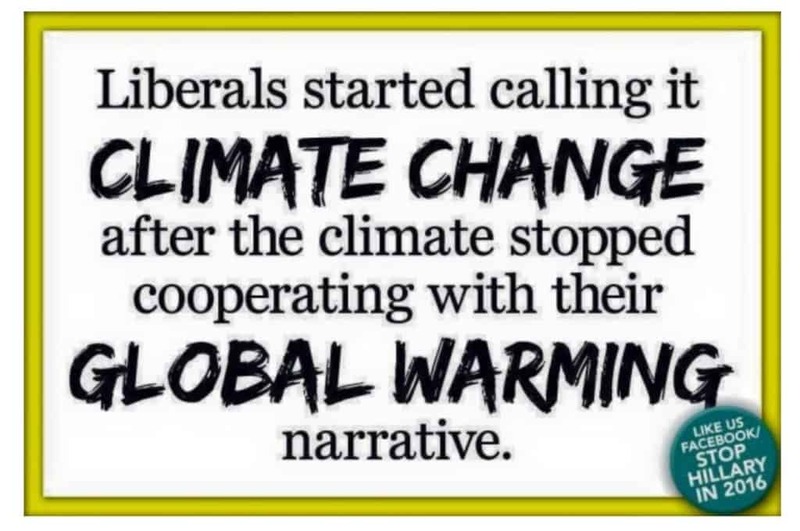 In this case, they needed the general public to “buy” the concept of global warming. Perhaps they underestimated the importance of public buy-in for driving behavioral change. Or perhaps they overestimated the public’s knowledge level and assumed that everyone knew a cold snap doesn’t mean global warming is fake. Either way, it was a near-fatal marketing mistake. Remember which audience you’re talking to, and resist the temptation to assume they’ll know what you’re talking about. Most of the mistakes I see happen when clients talk to prospective customers as if they’re people who do what they do instead of people whom they want to buy what they do. Don’t assume your audience will automatically understand (in this particular scenario) the difference between global warming and climate change. Or that several years of extremely cold weather doesn’t mean that the overall global climate isn’t warming. It’s also important to think about your URL. Jeb Bush has to win the prize for dumbest move on this one. There was nothing wrong with JebBush2016.com, but not also claiming JebBush.com was a rookie move, and he deserved to get scooped by Trump on that one. Big corporations spend millions choosing a name, partnering up with agencies like Name Lab and Brighter Naming. But not every company has the funds to do that, and not every situation calls for it. It is wise, however, to do some careful thinking and get honest feedback before you decide what to call something. So be careful what you name things, and keep your audience in mind. I’m somewhere between a Boomer and Gen X, and a lot of the names my kids mention are, in all honesty, made-up nonsense. It works for those companies, because their audience is on social media and pick it up from each other. (For example, I will never understand why a business productivity platform would choose the name Slack, but it sure seems to be working for them.) But if that’s not you, choose a name that makes sense. Need help with your content, whether strategy or writing? I’d love to help! Just email me at [email protected], and I’ll get in touch as quickly as I can. NextWhat are digital policies, and why do you need them?